In this guide, you will learn how to show or hide multiple form fields at once. This is a great tool if you want to show fields based on another field answer. This would tidy up your form and make fields visible only when needed. 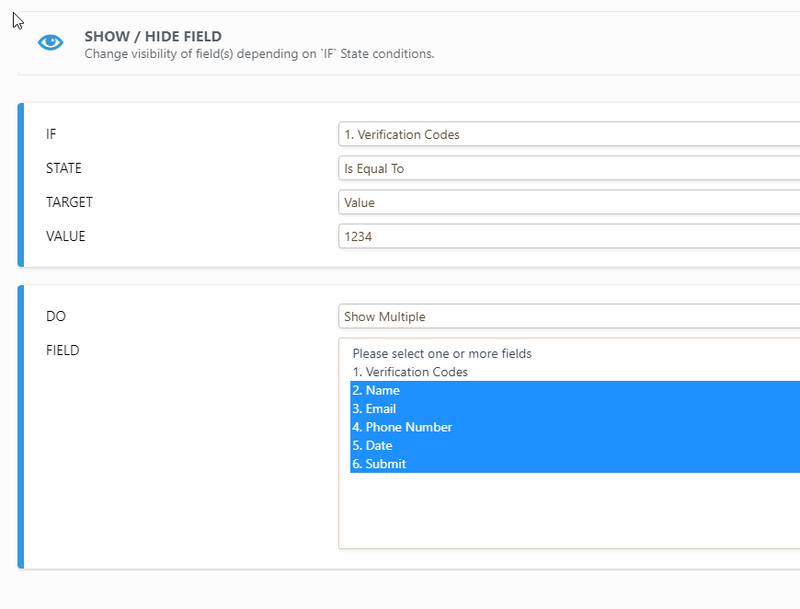 So, assuming that the form is already created with all the needed fields, you just need to follow the steps below in order to show/hide multiple fields at once. 1. 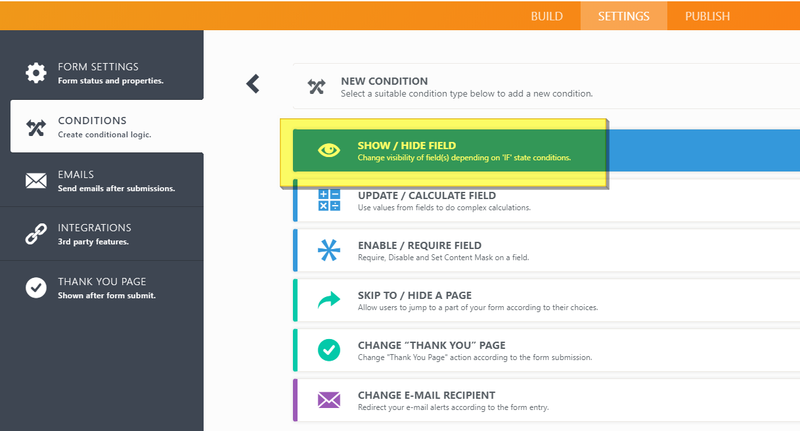 Click on Settings >> Conditions >> Show/Hide Field. 2. In order to show/hide multiple fields, select "Show Multiple" or "Hide Multiple" on the Do dropdown list then select the fields you want to show or hide by holding Ctrl key on your keyboard. This is the demo form: https://form.jotform.com/90543660719966. If you have any questions, please let us know by posting a comment below or by creating a thread into our support forum. My problem is different: my form asks for a choice of options for various meal courses. Fine! But now I want this same question but for two people. How do I duplicate the options for each course? Is there a way I can have unlimited amount of showing multiple fields? I have a registration form to enter horses, but the user can have an unlimited number, when I use the slider to enter that number, is there a way to bring up multiple entries for that number rather than Horse #1, Horse #2, Horse #3, etc in the collapsible field? When do you lot update your images to match the new changes you've made to the interface form builder? Yeah that's real helpful given that you now have your form builder updated with newer interfaces. And leaving us wondering what if greater statements we're supposed to be selecting. Then we're being offered up code snippets that don't work. I want the yes/no question "Esta despesa é para ser lançada no programa?" on my form only if specific conditions are matched. It depends on if a specific name from the field "Colaborador(a)" (Worker name) is selected and if the "Tipo de despesa" field (Expense type) is "Peças Técnica". I´ve tryed many different ways but when i choose the correct conditions the question do not get visible on my form. When I click the incident report form, another fields will show (lost/stolen/damaged/factory defect), and another fields will show up when you click lost. Then, when I click back to 'rollout form' or other fields in 'what's your query', fields under 'lost' still shows up. It should be hidden. But, how???? I have tried and saved and deleted conditions several times, but I cannot get it to work. im having problemas when my forms pretend to show several items at the same time, my conditionals only allow me to show once option at the time, how do i solve it ? http://form.jotformeu.com/form/43593743905362? Here the form of works . there is field 1 to field 9, and A to M dropdown menu. i've been setting up the conditions, but it doesn't shows up the fields that i want. could you please check what's wrong with my conditions in that form? i've been through the whole day try to fixed it up, and got no solution . There are conditions from point 2.2 that don´t work every time when customer uses the form. The same error occurs also in points 3, 5, 6, 7, 8 and 9. Many times when customer choose "yes", for example to field 2.2, the condition don´t work and the hidden fields don´t show. Some of the forms we receive from customers, these conditions have not worked and some of those they did. Where is the problem? I exactly need the "address" widget used in your demo. How-where could I find it, if possible? I have tried to set up the number of children being registered the same way you have set up the "number of guests" in your example. But if I set up the condition as such: If "how many children are you registering" is equal to 2 then SHOW child 2, HIDE child 3, HIDE child 4, HIDE child 5, it will still show every child registration. This is the same for any number more than number 1. I have a collapse stopper set up the way suggested after every child registration. What am I doing wrong? I'm allowing people to choose the number of dogs I will illustrate (1 – 4). With each additional dog, a new section should appear asking for name, breed and image upload. I can't seem to get this working right with my conditions. If they select 3 dogs then sections 1, 2 and 3 should appear but only 1 and 3 do. Getting really frustrated trying to make this work over the past day. I have 3 sets of names to collect (Adult Coach, Minor Coach and Team Member). Each team could have a varying number of adult coaches, minor coaches and team members. I want the form to only ask the team to fill in names for the proper number. I am trying just to get Adult Coach to work and then I can replicate to the rest. Can someone tell me how to make the conditions work for the Adult Coach radio button (it was a spinner for up to 10 adult coaches and I gave up trying to do the logic for 10 separate conditions). I have looked and relooked through examples that I could find and changed my form multiple times and nothing seems to work. This article really discusses showing one field based on multiple rules. What I want is to show multiple fields based on one rule. I created a questionnaire that asked how many children a person has and based on the answer (1 through 4), it opened a form collapse with either one child, two children, three children or four children. I wanted to simplify it so that if a person selects one child, one form collapse shows, but if they select three children, the the "one child," "second child," and "third child" form collapses ALL open. This will allow me to only have four sets of questions relating to the children rather than the 10 I needed before. Unfortunately, when I select two, three, or four children, only that one form collapse opens even though my "conditions" rule says that if a person selects, for example, four children, all of them should open. Can you help? It seems as if the condition setup allows you to do exactly what I need. Please let me know what I am doing wrong. I have used a collapse stopper in two different places in my form. The first one works perfectly, however for the second one all the fields that come after the stopper are invisible. I have the stopper set to "open" and "hidden". My understanding is that only the stopper should be hidden in this instance and the following fields should be visible. I have been trying for fields to be shown when a customer picks 'yes' for a question and those fields to be hidden when they choose 'no.' I have tried and saved and deleted conditions several times, but I cannot get it to work. Can someone please assist?? I am following the example by dividing the form into sections using Form Collapse and Conditions, but the form is not acting as I would expect. This is the scenario. This is to be an evaluation form in which the evaluator selects which musical emphasis a student is in: vocal, piano, bass, etc. Depending on the emphasis (condition), then a different set of evaluation questions should display (form sections). Instead, when I preview or test the form as designed, it displays all form fields and all sections, regardless of the emphasis selected. I am not sure if the problem is in the conditions set or in the application of form collapses. Thank you for any insights you can give me. I am trying to move the person to one particular section based on the field "Emphasis" using conditions as described but am not successful. Can someone take a look at my form and provide guidance? This would enable me to achieve what I want with my current form. I am using conditional logic on my forms, but but the rules are no longer visible after I Save. How can I edit the conditions? Is there a way to send two different auto response emails based on when the form is submitted? Even I chose "Hide Empty fields" option on the E-mails set-up when I receive the autoresponder email I still see the empty fields. How can I fix that? How do I add on a questionnaire - "Address is different from above" with the option to check the box and the address field would appear. Auto reply notification WITH conditions?